On July 12, the results of an independent investigation led by former FBI director Louis Freeh found that the leadership at Penn State had known about and covered up acts of sexual assault by assistant coach Jerry Sandusky. At the center of the decision to do nothing, the report found, was the legendary coach Joe Paterno. In the wake of the Freeh report, the university decided to remove Paterno’s statue from outside the football stadium. The NCAA instituted harsh sanctions on the university and nullified 111 victories under Paterno’s leadership. A new study by the Pew Research Center’s Project for Excellence in Journalism reveals that the events changed minds about the school and its football program, at least as measured by the conversation on the social platform Twitter. But it did nothing to alter the balance of views about Paterno. And as the dust settled, while his legacy was divided, Paterno was discussed more favorably on Twitter than the school or the football program. Before the Freeh report (from June 23 through July11) 42% of the conversation about Paterno was positive while 58% was negative. After the report (in the period from July 12-23), those talking about Paterno seemed hardly to budge in their views; 44% of the conversation was positive and 56% was negative. Many supporters argued that the statue of Paterno outside the football stadium should stay up and mourned when it was taken down on July 22. The study by PEJ involves an examination of the full fire hose of all public tweets and examined all of those that focused on the sexual abuse scandal. PEJ did the analysis using technology provided by the firm Crimson Hexagon. The Freeh report did have a significant impact, however, on how people on Twitter reacted to Penn State as a whole as well as its football program. After the report, the volume of the Twitter conversation about the role of the school and the program increased markedly–from 10% to 18% of the overall discussion of the scandal. Moreover, the percentage of that discussion that was critical of Penn State and its football program jumped from 60% to 78% after July 12. The response on Twitter to the July 23 NCAA sanctions–which included a $60 million penalty, a four-year football postseason ban and erasure of all wins since 1998–was mixed. More than half (59%) of the Twitter discussion opining on the NCAA ruling thought it was unfair or too harsh while 41% thought the NCAA was right to hand down those penalties. 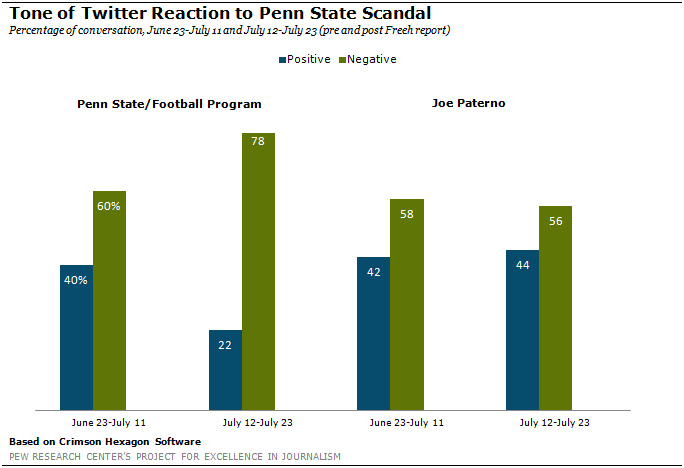 In the overall period from June 23-July 23, Paterno was a major, but hardly dominant focus of the Twitter debate. 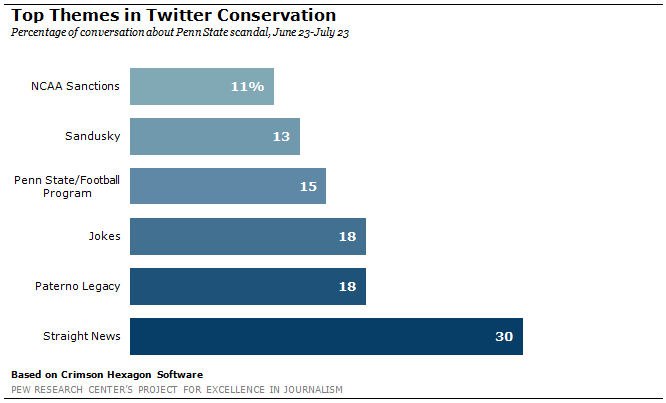 About one-fifth (18%) of the scandal-related Twitter conversation was focused on Paterno compared to 13% that primarily featured Sandusky and 15% on Penn State and the school’s football program. The passing on of straight news about the events comprised 30% of the conversation and joke about the situation made up another 18%. As time went on and new developments occurred, the man at the heart of the scandal-former defensive coach Sandusky-became less talked about on Twitter. Prior to the release of the Freeh report, discussion of Sandusky made up almost a quarter of the conversation (24%). But that decreased to 7% in the 10 days after the report was released and dropped even further (to 5%) in the day after the NCAA announced its penalties. Note: You can see an explanation of how Pew Research uses Crimson Hexagon here.